Hollow nanocrystals that can function as highly-efficient catalysers or transport containers for chemical agents are in great demand nowadays. Scientists from the Max Planck Institute of Microstructure Physics have created a procedure for combining chemicals to produce high quality nanotubes in large quantities. The researchers took advantage of the Kirkendall effect, which occurs during inter-diffusion between two solids. They used the effect to take nanowires of a certain chemical composition in the core and the shell, and produce nanotubes of a more complex composition. The scientists showed that this method can also be used to efficiently produce nanowires themselves (Nature Materials, August 2006). Compound nanotubes can be produced in various ways: rolling up layered materials, coating pores in templates, or eliminating the core of a core-shell nanowire. In the case of ternary compound nanotubes, most of these methods have limitations. They may need layered materials or templates (e.g., porous alumina). Or the nanotubes produced may have an insufficiently small aspect ratio. Frequently the crystallinity of the nanotubes produced is poor - that is, they consist of many grains that have different crystallographic orientations. Scientists at the Max Planck Institute of Microstructure Physics in Halle, Germany, have devised a generic technique for generating nanotubes with very good crystallinity of a ternary compound (i.e., a compound that consists of three different chemical elements). The scientists fabricated ultra-long single-crystalline ZnAl2O4 spinel nanotubes (total diameter: ~ 40 nm, wall thickness: ~10 nm). Spinels are ternary compounds of type AB2O4 that crystallise in a specific cubic structure. 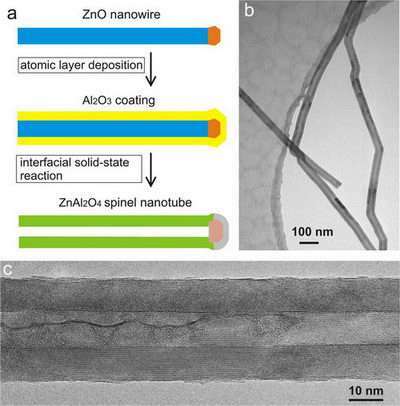 Nanotube formation is based on an interfacial solid-state reaction of core-shell ZnO-Al2O3 nanowires involving the Kirkendall effect. This effect arises when the interdiffusion between two solids is realized via vacancy transport and an asymmetry of the related diffusion rates occurs which finally results in the formation of pores. The researchers have used this effect to produce hollow nanowires, i.e. nanotubes. The latter grow due to the fact that the generated pores cannot leave the nanowires, which is a consequence of the spatial confinement given by the specific reaction geometry involving cylindrical symmetry. The method has a number of advantages. For example, the required voids need not be produced beforehand. This, in the end, allows scientists to fabricate three-dimensional nanostructures of complex shape. In addition, nanotubes with large aspect ratios can be obtained, and the method can be scaled up to produce large volume quantities useful for applications. Moreover, ZnO (part of medical salves) is very biocompatible. Finally, the method can be applied to many other types of ZnO- or MgO-based spinel nanostructures with adopted chemical composition and interesting properties.